The set includes the 2.5 qt. 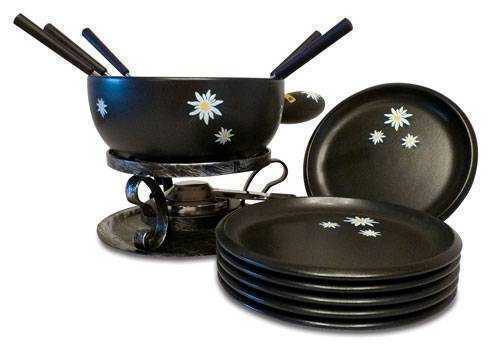 black ceramic pan with Edelweiss flower accents, 6 black fondue plates, 6 matching forks and The Classic paste burner. Note: Paste fuel not included - order paste fuel separately. Service Area: New Glarus, Beloit, Madison, Rockford, Middleton, Stoughton, Whitewater, Baraboo, Oregon WI, Platteville, Verona and surrounding communities.